Welcome To The Electric Lounge! You may be shocked to know Jackson Lighting and Electric Supply has a licensed electrician on staff! Prior to joining the Jackson team in 2016, W.E. Conduit worked in condo/pool maintenance, worked for the Southern/Pacific Railroad and was a Submariner in the U.S. Navy. 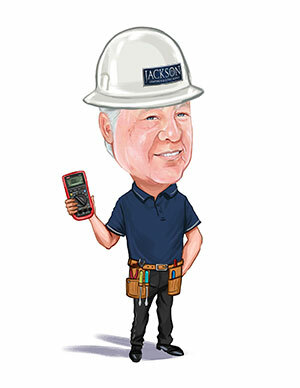 Mr. Conduit has been a licensed journeyman electrician since 1972 (that's over 46 years) and held his Duval County Journeyman's ticket since 1989. When W.E. Conduit isn't boning up on the latest revision to the NEC, he enjoys being a Deacon at church, playing the saxophone and spending time with his twelve grandchildren and three great grandchildren. ANSI (American National Standards Institute) The organization that develops voluntary guidelines and product performance standards for the electrical and other industries. Directional lighting used to highlight a particular object or area. Electron flow that periodically reverses polarity and direction of travel through a circuit. The overall lighting in an area or room. Inert gas used in incandescent and fluorescent lalmp types. In incandescent light sources, argon retards evaporation of the filament. An average rating, in hours, indicating when 50% of a large group of lamps have failed, when operated at nominal lamp voltage and current; manufacturers use 3 hours per start for fluorescent lamps and 10 hours per start for HID lamps when performing lamp life testing procedures; every lamp type has a unique mortality curve that depicts its average rated life. A device used with an electric-discharge lamp to obtain the necessary circuit conditions (voltage, current and waveform) for starting and operating; all fluorescent and HID light sources require a ballast for proper operation. The measured ability of a particular ballast to produce light from the lamp(s) it powers; ballast factor is derived by dividing the lumen output of the same lamp(s) on a reference ballast. The angle between the two directions for which the intensity (candlepower) is 50% of the maximum intensity as measured in a plane through the nominal beam center line. In any plane, the angle between the two directions in the plane in which the candlepower is equal to a stated percent of the maximum candlepower in the beam. Term for electrical light source or lamp; the outer shell of the lamp. Darkening or discoloration of an incandescent lamp due to tungsten particles collecting on the inside of the glass as the filament burns and diminishes over its life. Unit measurement of luminous intensity. The luminous intensity of a light source expressed in candelas. The aspect of color that includes consideraton of its dominant wavelength and purity. Refers to a lamp with a special phosphor or coating to give it a color rendering profile like natural daylight. A measurement to rate a lamps ability to render an objects color. The higher the CRI, on a scale of 0-100, the more true to life colors appear, as they would in natural daylight. The visible light spectrum, ranging between 380 (violet) and 770 (red) nanometers in the electromagnetic spectrum. Refers to light sources mounted above a ledge or in a recess that distribute light upward for ambient lighting. A measure of the rate of flow of electricity, expressed in amperes (A). Lumen value at 40% of rated average life. The even redirection or spreading of light by a lens or diffuser. A directed lighting unit, usually small, that aims the light downward. Can be recessed, surface mounted or suspended. Referes to the efficiency of a light source expressed in lumens per watt (LPW). The light source may be a lamp or luminaire. Incandescent lamp with a reflector shell which is elliptically-shaped. Focuses light immediately in front of the lamp which reduces absorption and increased efficiency. Energy legislation passed by Congress in 1992 mandating labeling and minimum energy efficiency requirements for many commonly used incandescent and fluorescent lamps. Systematic cost comparison of an existing system to a proposed system, accounting for electrical, material, maintenance and labor costs. Markings on the glass envelope or shell of a lamp designating product description, logo and/or brand name. The total light which comes off of a surface. Exitance is dependent upon the illuminance on and reflectance of the surface. A glass tube coated on the inside with a fluorescent substance that gives off light when mecury vapor in the tube is excited by a stream of electrons from the cathode. A unit of measurement of direct illumination. One footcandle is equal to one lumen per square inch. Broad spectrum light source capable of producing colors throughout the entire range of the visible spectrum; simulating actual sunlight. High CRI's and Kelvin temperatures ranging between 5500 and 5900. Uniform light throughout an area, with no special provisions for task lighting or accent lighting. A regenerative cycle of tunsten and halogen atoms which prevents blackening of the lamp envelope during the life of the lamp. Luminaire for a track-lighting system. Metal Halide, High Pressure Sodium, Low Pressure Sodium and Mercury Vapor lamp types. HPS lamps are high intensity discharge light sources which produce light by an electrical discharge through sodium vapor operating at relatively high pressures and temperatures. Voltages of 208 or higher. Light arriving at a surface, expressed in lumens per unit area; 1 lumen per square foot equals 1 footcandle, while 1 lumen per square meters equals 1 lux. The results of the use of light. A light source that produces light by the heating of a filament by an electric current. To calculate the metric equivalent of inches in millimeters (mm), multiply inches by 25.4. Luminaires that distribute 90 - 100 percent of their light upward to be reflected by the ceiling. Radiant energy in the wavelength range of about 770 to 1100 nanometers (nm). Energy in this range is not visible to the naked eye, but can be sensed by the skin. Applications include heat lamps, photography, medical therapy, and industry. A type of fluorescent lamp-ballast circuit designed to start fluorescent lamps as soon as the power is applied. Originally, instant-start circuits were developed to eliminate separate mechanical starter devices. Slimline fluorescent lamps operate only on instant start circuits. The light emitted from a source. Intensity varies given the direction at which one views the source. Intensity does not vary with distance. A heavy inert gas used in incandescent lamps which allows the filament to glow hotter and brighter and last longer. Lighting industry term used for a light bulb. Bulb designations consist of a letter(s) to indicate shape and a number to indicate the diameter in eighths of an inch. A glass or plastic element used in luminaires to change the direction and control the distribution of light rays. The distance from a reference point, usually the bottom of the lamp base, to the center of the light source (filament). An assembly of slats or crosspieces in a lighting fixture, used to control light intensity and glare. Low Pressure Sodium (SOX) High Intensity Discharge lamp which uses pressurized sodium vapor to produce light. International unit (SI) of luminous flux or quantity of light. Expresses quantity of light regardless of direction. A measurement of the efficancy (efficiency) of a light source. The number achieved by dividing lumens produced by watts consumed. A complete lighting unit including lamps, housing, lens and ballast if required. All the necessary components to make what we commonly refer to as a "fixture". Light reflected in a particular direction; the photometric quantity most closely associated with brightness perception, measured in units of luminous intensity (candelas) per unit area (square feet or square meters). The overall length of a lamp, from the top tof the shell to the bottom of the base. A high intensity discharge light source operating at a relatively high pressure (about 1 atmosphere) and temperature in which most of the light is produced by radiation from excited mercury vapor. Phosphor coating on some lamp types add additional light and improve color rendering. A high intensity light source in which the light is produced by the radiation from mercury, plus halides or metals such as sodium, scandium, indium and dysprosium. Some lamp types may also utilize phosphor coatings. A unit of length equal to 10 to the -9th meters, or one billionth of a meter; commonly used as a unit of wavelength. A measurement for Fluorescent lamp length, based on the length of the lamp plus an allowance for luminaires lamp holders. A scientific law which states that current (amperes) in a circuit depends on resistance (ohms) and applied electromotive force (volts). Current (I) = Voltage (E) / Resistance (R). Lamps may be operated in any position unless otherwise noted. PAR is an acronym for parabolic aluminized reflector. A PAR lamp which may utilize either an incandescent filament, a halogen filament tube or HID arc tube is a precision pressed-glass reflector lamp. PAR lamps rely on both the internal reflector and prisms in the lens for the control of the light beam. Refers to vision involving the cones of the eye; used in reference to the adaptation of the eye to illuminance of more than 3.4 candelas per square meter. A fluorescent lamp-ballast circuit where the electrodes are heated or warmed by an auxiliary switch or starter before the lamps light up. A fluorescent lamp-ballast circuit which utilizes continuous cathode heating, while the system is energized, to start and maintain lamp light output at efficient levels. Rapid start ballasts may be either electromagnetic, electronic or of hybrid designs. Full-range fluorescent lamp dimmming is only possible with rapid start systems. An incandescent, compact fluorescent or HID lamp with a built-in reflecting surface. Incandescent and HID versions are made from a single piece of blow-molded soft or hard glass. Sight involving the eye's rods, which respond to low levels of lighting, below .034 candela per square meter. A graph of the radiant power emitted by a light source as a function of wavelength. SPD's provide a visual profile of the color characteristics of the light source throughtout the visible part of the spectrum. A device used in conjunction with a ballast to start preheat fluorescent lamps. The Toxicity Characteristic Leaching Procedure (TLCP) test, specified in the Resource Conservation and Recovery Act (RCRA) of 1990, is used to characterize fluorescent lamp waste as hazardous or nonhazardous waste. The TCLP test measures the ability of the mercury in a lamp to leach from a landfill into ground water under very aggressive and reactive conditions. A circuit used that eliminates the starter and allows for instant starting of preheat lamps. Radiant energy in the wavelength range of about 100 to 380 nanometers (nm). This light is invisible to the naked eye and is also known as black light. Radiant energy in the wavelength range of about 380 to 770 nanometers (nm). The light that can be seen by the naked eye and produces what we also call the "color spectrum". The unit of electromotive force (emf). The difference in electrical potential that will cause a current of one ampere to flow through a resistance of one ohm. The recommended operating voltage for a lamp. A unit of electrical power. One watt is equal to one ampere of currrent flowing through one ohm of resistance. Distance between two successive points of a periodic wave; the wavelegth of light are expressed in nanometers.